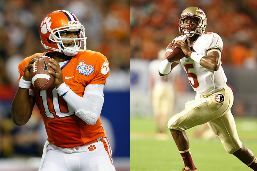 We are just four days away from what some are calling the biggest game in ACC history. This is a game I am both looking forward to and am scared to death of at the same time. Jameis Winston and his Noles are rolling into town for the first time since 2011 where the Tigers were able to pull out the win. Unfortunately that was two years ago and both teams have changed dramatically. The one promising aspect is that Clemson is head and shoulders better than they were two years ago. Once again ESPN’s College GameDay will be in Clemson, only the 3rd time they have returned to the same school in the same season, and the 1st time that have returned within the first 7 games. This is truly going to be a special day at Clemson University and then in Death Valley. Whether or not we win or lose (unless we just get totally blown out) this is going to once again be great exposure for our University and our football program. I can’t even imagine how many NFL scouts will be at this game as well as players we are looking to recruit for years to come. Our receivers against their secondary. Clemson is know right now for having an explosive offense which can score quick and score a lot using the many weapons we have at receiver. Our defensive line against their offensive line. We know both quarterbacks have incredible passing accuracy but both can also quickly scramble out of the pocket if no one is open and running for positive yardage. We need to get pressure on their quarterback and not allow him to run down field. Special teams. We have been using Adam Humphries a lot lately for punt and kick returns but although he has great speed, he has had a hard time getting the big returns like we used to see in CJ Spiller and Jacoby Ford. This is where the Seminoles find ways to score extra points if their offense goes 4 and out too much. Yes, they have speedy returners but they also have a great ability to block to help get that returner to the end zone. I will close by saying this, no matter what happens we have become the kind of football team I have always wanted Clemson to be. They push through adversity and never give up, never. Two great examples are last year against LSU and this year against Boston College. In the BC game we came back in the 2nd half and outscored the Eagles 21-7 en route to a 24-14 win. Last year we were 4-16 with just over a minute on the clock. Tajh through a perfect pass to DeAndre “Nuke” Hopkins for a 1st down and a few plays later clutch kicker Chandler Cantanzaro put up the game winning field goal. Coach Dabo Swinney has said it again and again, that is what great teams do. They find ways to win. Sometimes it looks pretty (LSU) and sometimes it is ugly (Boston College) but remember, a win is always a win. I hope that’s exactly what we get this coming Saturday.